Perusing the department's or program's website as intuitive as it sounds is something a lot of people do not do. A lot of departments state on their website whether they offer funding or scholarships to master's students or not. Some would even go as far as stating the criteria they consider when offering funding or scholarships to master's students such as TOEFL scores (especially in the speaking section), GRE scores, GPA and past research or teaching experience. Some department or programs are also nice enough to state what percentage of their master's students in previous admission cycles got funded or scholarships. So if you are trying to find out if a department or program you are interested in offers funding or scholarships for master's students, the department or program website should certainly be your starting point. Many times, the information about funding or scholarships for master's students on the departmental websites is usually vague and ambiguous. Some departments do not update their sites regularly, so the information there about funding or scholarships might be outdated or maybe you just need some form of verbal or written feedback from someone who actually works at the department and in the right position to answer your questions. The person who you should be looking to contact is the department's Graduate program coordinator. The Graduate Coordinator is the authorized person in the department to speak on issues like funding, scholarships, eligibility, prerequisites and so on. The graduate coordinator could go by other titles such as Director of Graduate Programs or something similar. You can always find the contact of the Graduate coordinator on the department's website when you look at their staff directory or it could be placed on the web page that lists the requirement for prospective master's applicants. When emailing the graduate coordinators, it helps to state if you are a local/international student, your undergraduate insitution, what semester you will be applying to Fall, Spring or Autumn. State clearly what information you need--in this case information on funding or scholarships. It may also be helpful to attach transcripts, GRE scores, TOEFL scores, CV/Resume, and research papers (if any) to enable them to give you more informed feedback. The attachments should be combined into a single PDF file. In the search bar, type as an example "Teaching Assitant Stanford University Computer Science" or "Research Assitant Harvard University Computer Science" or "Graduate Assitant Computer Science MIT"
Linkedin would display a lot of results based on your search query, then go through the profiles of some the results, check their profiles to see if they are currently graduate students in the department, if they are, add them to your connections and wait for them to accept your request. You might want to add up to 10 or 12 of them and hope a good number of them would accept the invitation to connect. When they have accepted, message them and politely start by thanking them for adding you to their connections and proceed to ask your questions as concisely as possible--do not waste their time with small talk. When it comes to seeking admission into graduate schools in the United States, Canada, The UK and so on, thegradcafe.com is a site that would provide you with a lot of information that you just wouldn't find elsewhere. Thegradcafe.com has a database of over 500,000 admission results so it is certainly a place you would want to look. 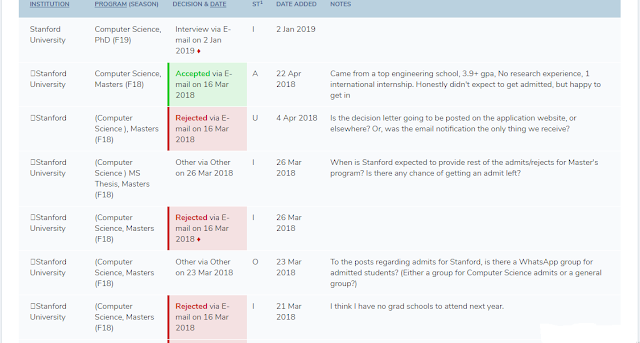 On thegradcafe.com applicants in past admission cycles post their admission decisions, GRE scores, GPA and whether they were funded or got a scholarship or not. 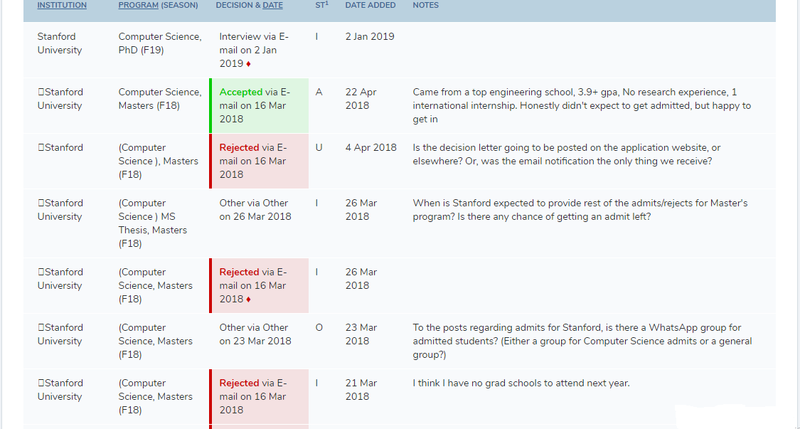 It is a good place to compare your profile with profiles of past applicants who were admitted or were rejected from the program you are applying to. Simply use the search bar in the sites' homepage and type the department and the school you intend applying to and it would display a lot of information from past admission cycles dating years back. Example, when you type "computer science Stanford" this is the result it displays. The screenshot does not show all the results, it only shows a very small portion of it. NB: Whether you are perusing the department's website, contacting the graduate coordinator or the program chair or looking for information on thegradcafe, LinkedIn or Quora, please always ask questions that are laser targeted to your own situation and profile. Some departments might fund or give scholarships to master's students from the first semester but would only do so if you had your first degree in the United States, they do not fund or give scholarships international students from the first semester. Some departments funding or scholarships only cover out-of-state tuition, some only offer funding or scholarship to students applying for the Fall semester and some departments only fund or give scholarships to students with a GRE score, TOEFL score or GPA above a certain score--which is usually much higher than the minimum scores required to get admitted. With this in mind, it is very important to ask questions or seek answers specific to your situation.